BLAEU - Paderbornensis Episscopatus Descriptio Nova. BLAEU, W. - Paderbornensis Episscopatus Descriptio Nova. Paderbornensis Episscopatus Descriptio Nova. 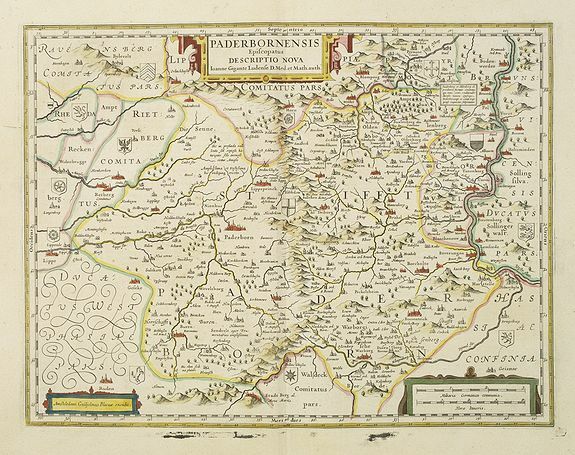 - BLAEU, W.
Title : Paderbornensis Episscopatus Descriptio Nova.. Size : 14.6 x 19.1 inches. / 37.1 x 48.5 cm. Description :Detailed map centered on Paderborn. Embellished with several coats of arms. Prepared by Joannes Michael Gigas (1580-1650+), a doctor, mathematician and geographer who made also maps of Osnabrug, Westphalia, Münster and Hildesheim. V.d.Krogt/Koeman, Atlantes Neerlandici, Vol.2, 2350:2.2. Condition : A good and dark impression. French text on verso.